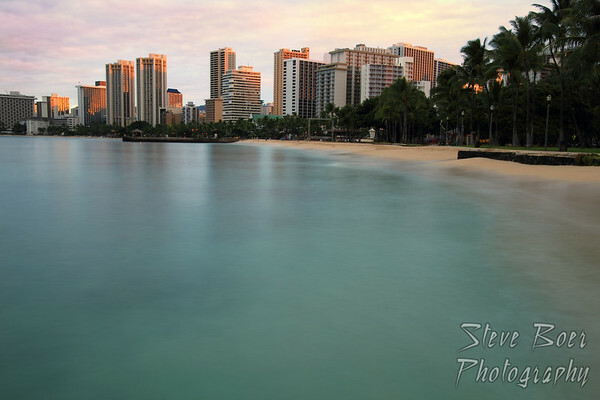 A long exposure of Waikiki Beach is random number photo 5771. I love the public beach at the far end, across from the Hyatt. Will be on the Big Island soon. It’s been almost 10 years since we were on the Big Island, hope to get back there again, but need to check out Kauai first too! Kauai is wonderful. In the header there is a menu button for Hawaii, you can see what I saw on the various islands. Thanks Ron, I’ll take a look! Simply beautiful!…from one who has very limited photographic knowledge does the long exposure wipe out the surf? Thanks Rebecca, yes, the long exposure turns the surf smooth and misty. What time of the day did you take this? Love it! Thanks! It was taken at sunrise, which was somewhere around 5:30 or 6 am I think.